What do a lumberjack, a mechanical bull and a dock-jumping dog have in common? The Wild Outdoors Festival! A playground for the great outdoors enthusiast, the Thanksgiving Point festival offers a rucksack of interactive activities, including Buck Wild mechanical bull riding and an Air Force simulator; as well as informative demonstrations including camping displays and a fly-fishing demo. 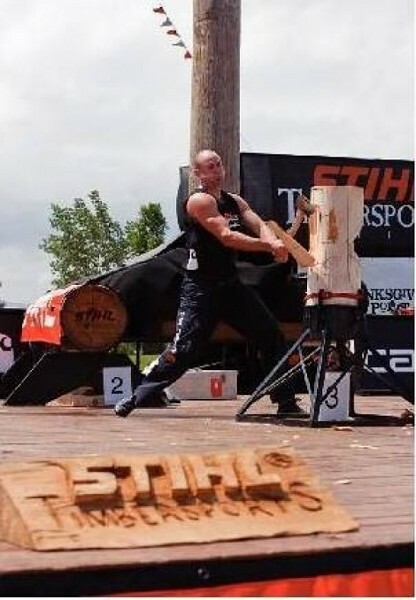 The festival is hosting the 24th season of the STIHL Timbersports series, inviting professional athletes from all over the world to contend in a variety of traditional lumberjack skills competitions. The head-to-head games include “stock saw,” a contest involving chainsaws and the craft of the clean cut, and “springboard,” a race to the top of a 9-foot pole using two springboards. The STIHL Timbersports series is a national and internationally televised sporting event on ESPN2. The publicized event will provide a podium for Utah’s pride and love for our greater outdoors. Also a dog-friendly event, the festival is featuring Splash Dogs, a dog-devotee business that tours the United States organizing and promoting dog dock-jumping competitions. With wet paws soaring through the air, the sport of pup water pouncing provides competitive fun for the whole family. Another K9 activity presented is Course A’ Lure, a Utah-based traveling dog obstacle course. Using a lure, the owners Bob and Cyndi Conwell can lure even the most timid of hounds through the run. Fun for all—the four-legged furry kind and the outdoorsy aficionado.